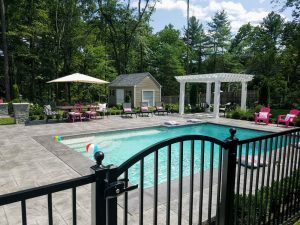 At IVY STUDIO LLC, a landscape design and build firm based in Massachusetts, we are redefining traditional pool and spa building methodology. We are often called on to consult with clients about their dream pool and spa projects for their residential properties. With the current trend in downsizing property acreage as well as house footprints, this does not negate the possibility of pool/spa ownership opportunities. In the case of designing the ideal aquatic project where a pool and spa are the focal point of an expanded outdoor environment, size does matter and in some instances less is more. You can have all the benefits of a pool and spa in a reduced footprint and some of the loveliest features in what we affectionately call a spool, which is a combination pool and spa all in one. These spools are a perfect solution for a smaller yard with all the attributes of a normal size pool and spa and are typically designed in square, rectangular or circular shapes with multiple jets for therapy and large enough to swim in and intimate enough to share a spa experience with friends and family. Integrated into your outdoor environment, these spools offer the best of both worlds and we can see why their popularity is on the rise. Contact IVY STUDIO LLC at 781- 591-0300 or vern@ivystudioMA.com to learn how a spool may well the answer to your limited outdoor space.